 UNIVERSAL: The word says it all! 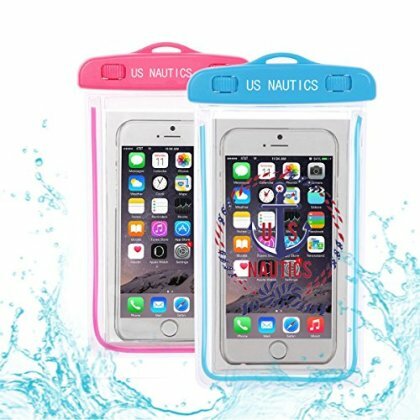 Now you can protect your CellPhone, cash, credit cards from water, snow, sand, dust with one smart waterproof , dustproof, snow proof, sweat proof, sand proof Dry Bag Pouch Case by U.S. Nautics.  TOP NOTCH QUALITY: The U.S. Nautics created a very resilient, thoroughly tested through a very rigorous process to ensure highest quality for our products. IMPORTANT: Before use, please test the pouch by inserting a dry cloth or napkin inside it and sink it into a container with water to ensure it does not leak.  STUNNING DESIGN: The clear universal waterproof Pouch allows you to use your phone even while in water, taking pictures, movies, or simply reading your e-mails and texts.  COMFORTABLE TO WEAR : Designed with customer in mind, the Case comes with a compass lanyard to wear it around your neck and a very comfortable arm band to securely store your belongings.  FOR AN ACTIVE LIFESTYLE: Great for outdoor activities like swimming, fishing, sailing , boating, hiking, camping, or participate in your other favorite outdoor activity without leaving your device behind or worrying about protecting your device.